Happy New Year to all. 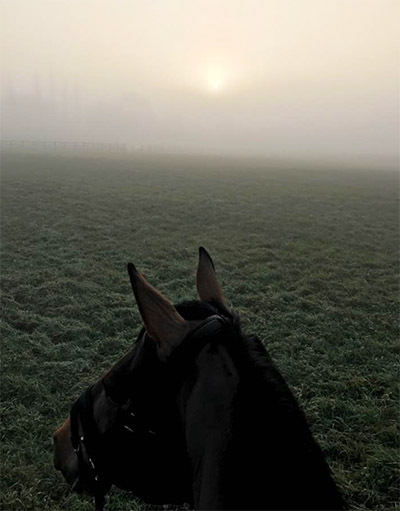 I can’t believe how quickly the winter is going and despite my new dressage career I still have a few event horses in, most notably Mister Maccondy, owned by Hugh and Ann Lawson, who is up and running ready to start the season with Polly Stockton at the helm. I am certainly not stopping jumping or being involved in the eventing, so it is exciting to be part of Team Stockton as well as having all my eventing clients to support. On the dressage front I have been busy training over the winter months with regular trips to Judy Harvey’s yard in Buckinghamshire plus Bert Rutten was over from Holland for a couple of days so it was great to catch up with him and have some fabulous lessons. The horses are all progressing well with their training. Last week Judy was able to come and stay so it was great to have two consecutive lessons. Gary Power’s PSH Twilight (Twee) is preparing for the regionals at Novice and Novice Freestyle, my own horse Falcon is working towards qualifying for the summer regionals at Medium an Advanced Medium and Breight Said Fred is looking to qualify at Elementary. We have been so lucky to still ride in the fields this winter, the ground has been amazing. So the horses have been able to stick to their varied work plan working on different surfaces and so far haven’t been limited by the weather. Fingers crossed the rest of the winter continues in the same vein. Yesterday was our first show of the year at Fieldhouse with Twee doing his first Elementary. He produced some great work to win with 72.41%. Next up for Twee is a trip to Rodbaston to have a run through his new music by Tom Hunt. Being a black stallion it is very powerful music so really suits him. Judy is coming up again before the regionals, so that will be a chance to fine tune things ready for the Myerscough Regionals on the 17th & 18th February. Meanwhile the first event is Isleham with Mac and Polly.